Dearborn, Mich. (Jan. 25, 2019) – The opportunity has arrived for metro Detroit’s Arab American community and those who support it to hit one out of the park! 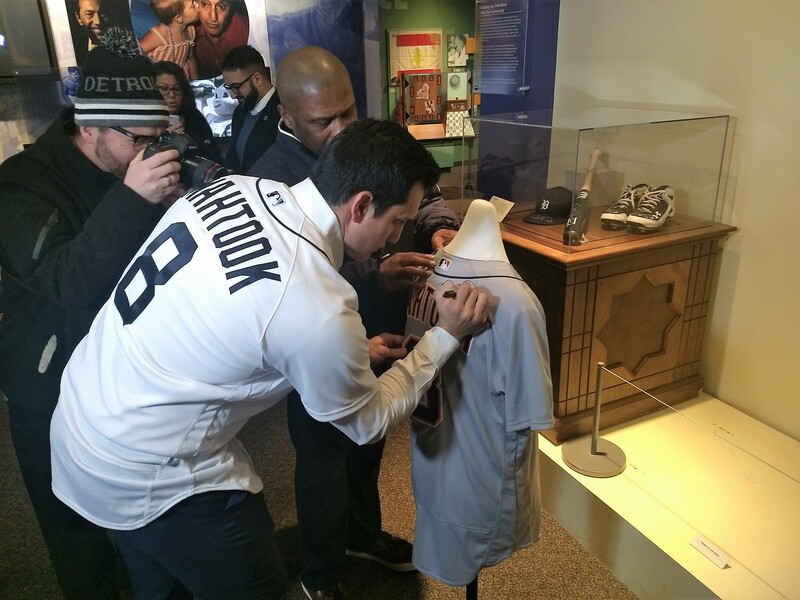 The Detroit Tigers and the Arab American National Museum (AANM) announced a very special event during today’s Winter Caravan visit to the Museum: the only Arab American Night in the majors, taking place at 7:10 p.m. Tuesday, Aug. 6, 2019, at Comerica Park in Detroit. The evening is sponsored by Tigers partner Saad Wholesale Meats. Those who purchase tickets — available in advance only, via a special link — will not only enjoy America’s greatest pastime, they’ll also receive a free Tigers tee shirt bearing both the old English D and the AANM logo, and a free-admission pass to visit the Museum. Group rates for parties of 15 or more are available. In addition, $3 from every ticket sold as part of this promotion will be used to support AANM, the only museum in the U.S. devoted to the Arab American community. “We are grateful for the support of the Detroit Tigers, which helps us amplify our mission as an Arab American institution. This partnership to host Arab American Night at Comerica Park, along with the opportunity to connect with a well-known Arab American professional athlete, allows us to elevate the voice of our community and its contributions to our nation,” says Lina Hourani-Harajli, COO of the Museum’s parent organization ACCESS, the nation’s largest Arab American community nonprofit. The Winter Caravan brought two distinguished Tigers to AANM: legendary hitting coach Lloyd McClendon and outfielder Mikie Mahtook, who is of Lebanese American heritage. They both enjoyed a brief Museum tour prior to a ceremony marking the latest addition to the Mikie Mahtook Collection at AANM. During the ceremony, Mahtook revealed and autographed the jersey he wore during the Tigers 2018 season opener. The jersey joins game-worn cleats, a cap and a bat, all autographed by Mahtook, in the permanent collection at AANM. The Museum gifted Mahtook with information about his family history. From a Syrian Lebanese business directory circa 1908, Mahtook received an image of the page listing the dry goods and grocery store in Patterson, Louisiana, owned by his great-great-grandfather, Butros Mahtook. Another image was a census record from 1930 listing Mahtook’s great-grandfather, Antoine, his wife Elle and their four children, residing in Lafayette, Louisiana, which is also Mikie Mahtook’s home town. “Being here and learning the history, seeing how beautiful this museum is, it inspires me,” Mahtook said after revealing the jersey. “I’m very grateful for my ancestors and what they did to come here to make a better life,” he said. 2100 Woodward Ave., Detroit, Mich.